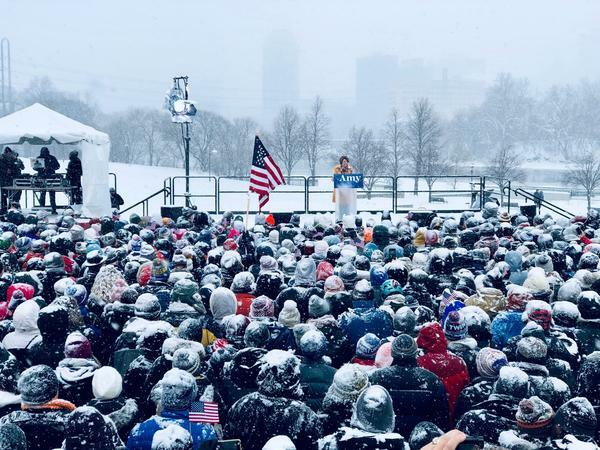 Sen. Amy Klobuchar , D-Minn., announces her candidacy for president during a snow fall on Feb. 10, 2019 in Minneapolis, Minnesota. Minnesota Democratic Sen. Amy Klobuchar announced she's running for president on Sunday afternoon, joining a crowded and historically diverse field of candidates seeking to defeat President Trump. She is the fifth Democratic senator to launch a White House bid, with others still contemplating joining a primary field that has grown to 11 candidates. The three-term senator cast herself as a practical, Midwestern problem-solver focused on results, not ideology. "We are tired of the shutdowns and the showdowns, of the gridlock and the grandstanding," said Klobuchar during a snowy, cold outdoor event in a park in Minneapolis. "Our nation must be governed not by chaos but by opportunity." 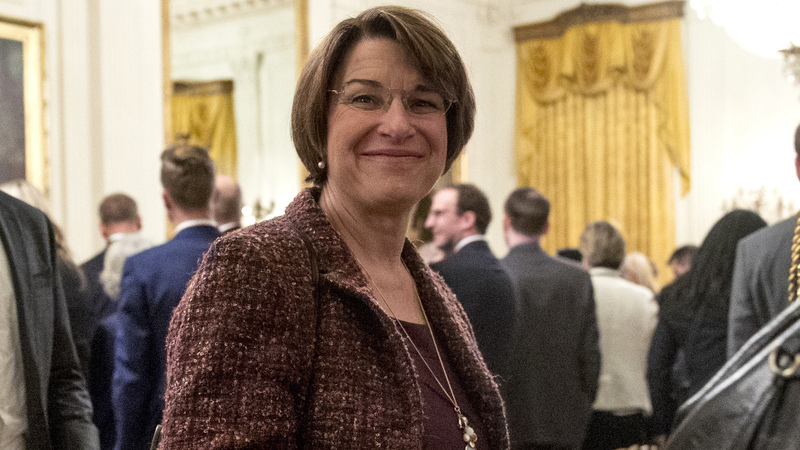 The 58-year-old Klobuchar was elected to the Senate in 2006 — the first elected female senator from Minnesota — and has been re-elected easily twice since. Before coming to Congress, she was the Hennepin County Attorney for eight years, serving as the chief prosecutor for the state's largest county, which includes Minneapolis. In that role, she secured almost 300 murder convictions and worked to curtail gun crimes. Her prosecutorial style was on display during last year's hearings for now-Supreme Court Justice Brett Kavanaugh, who was accused of sexual assault when he was younger. Klobuchar pressed Kavanaugh on whether he had ever been drinking so much he had blacked out and the defiant nominee threw the question back at her. Kavanaugh would later apologize, but the issue was deeply personal for Klobuchar, whose father, a well-known sports columnist in Minnesota, was an alcoholic. In the Senate, she's championed consumer protection issues, backed stricter online privacy regulations and worked on lowering the cost of prescription drugs. Sen. Amy Klobuchar, D-Minn., departs following a Medal of Freedom ceremony in the East Room of the White House. Klobuchar isn't as progressive as some of her potential Democratic competitors. She hasn't supported a Medicare for All plan, though she has said it "should be considered," and she hasn't called for other far-left ideas such as abolishing Immigration and Customs Enforcement all together. Klobuchar is seen as more of a pragmatist on Capitol Hill, with her vote rankings typically putting her somewhat in the middle of the Democratic caucus. "It is time to organize, time to galvanize, time to take back our democracy," said Klobuchar, who called for getting money out of politics, strengthening voting rights, combating global warming, reducing income inequality and making healthcare more affordable. Indirectly addressing President Trump, Klobuchar said, "stop the fear-mongering and stop the hate." Compared to many of her colleagues, Klobuchar hasn't sought the media spotlight that much and doesn't have the same kind of social media or fundraising presence that some of her rivals do, a point she sought to counter in her announcement speech. "I don't have a political machine. I don't come from money. But what I do have is this: I have grit," said Klobuchar. In the past week, Klobuchar has been dogged by anonymous, published accusations that she has mistreated her staff. Speaking to reporters after the announcement, Klobuchar didn't specifically deny any of the allegations. "Yes, I can be tough," said Klobuchar. "And, yes, I can push people. I know that. And I have high expectations for myself. I have high expectations for the people that work for me. But I have high expectations for this country. And that's what we need." Her presidential announcement is no surprise. She's been making political visits to neighboring Iowa for several years and has hinted for a long time she was seriously weighing a run. "I will say that I have made very clear that I am looking at this," she told MSNBC on Jan. 15. "I also had said I wanted to talk to my family, so big news today: My family is on board, including my in-laws, showing some momentum. But I will make this decision on my own course regardless of what other candidates are doing." She also has argued that her background and geographical base could help her in a general election, as opposed to other candidates. The Midwest helped Trump win his unexpected victory in 2016. Klobuchar has made the case that she could help Democrats be competitive in blue collar, rural areas where they've been lacking, giving off a possible "Minnesota Nice" vibe. The title of her 2015 autobiography was The Senator Next Door: A Memoir from the Heartland. "I think that there are a lot of good people considering this, but I do think you want voices from the Midwest. And I think you want to have people with different views running," Klobuchar told The New Yorker in Dec. 2018. Klobuchar is scheduled to head to Iowa again later this month, with a speaking engagement on Feb. 21 outside Des Moines.